See what sets us apart from other online survey services. The Net Promoter Score (NPS) is designed to quickly give you a view in how your company is performing by asking your customers a simple question, “How likely is it that you would recommend [COMPANY X] to a friend of colleague?” The question is simple to understand, quick to finish and easy to monitor. One of the reasons for the proliferation of the use of the NPS score is that good NPS scores have been shown to be correlated to revenue growth. Meaning, the higher the NPS score, the more likely you are to grow faster than your competitors. SurveyTown, allows you to create an NPS survey that you can publish out to your customers. The mobile-friendly NPS survey can be linked from your website, send to the customer in an email, or embedded into you post-checkout processes. In addition to registering each response, an overall score is calculated given all responses. Here’s how the overall score is calculated. Every customer that rates you between 0 – 6 is considered a “Detractor”. Anyone who rates you with a 7 or 8 considered a “Passive” and anyone that rates you with a 9 or 10 is considered a “Promoter.” The Net Promoter Score is calculated by subtracting the percentage of customers who are Detractors from the percentage of customers that are Promoters. Get a more detailed explanation of NPS calculations and the formula or, for those of you who hate math, try out our NPS calculator. SurveyTown’s NPS score combined with our reporting capabilities allow you to see how your NPS score changes over time so you can keep a tab on how your business is performing. Additionally, you can pass in additional data when a customer takes the survey so that you can further slice-and-dice results given other criteria you know about your customers, such as product purchased or the store they purchased from. Additionally, you can also setup SurveyTown surveys to alert company personnel to negative reviews via email so they can pro-actively solve customer problems. Customize your NPS survey to show different result pages based on their customers NPS ratings. 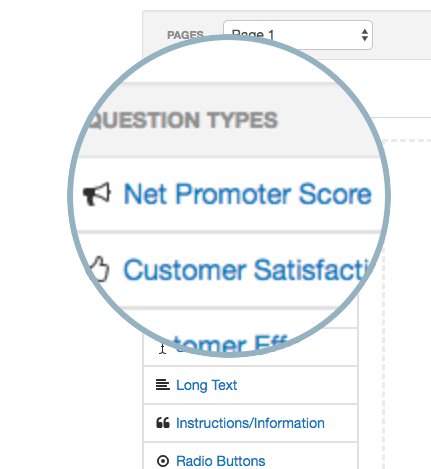 Quickly create a Net Promoter Score (NPS) survey by dragging and dropping a Net Promoter question into a new survey. We automatically create the question text for you. You can also customize the survey with an additional question(s). We recommend adding a comment box that asks the customer why they gave the score they did. Once created, we provide for you a URL that you can post on your website. If you want to embed the NPS question in an email, we also provide you with some HTML that you can embed in an email. Once your customers answer the survey question, we will add them into a report you can see in our interface. Your results can also be received via our Webhooks or retrieved via our API. The easiest way to create online surveys! Create an account and get set-up in seconds. What can SurveyTown do for you? If you have questions about our plans or need some guidance on the type of plan that is right for your organization, please contact us. We’re happy to help!